Just a short update today, because the piece is finished and here it is! I’m really please with the end results and delighted to have had the opportunity to create the piece. Well February is nearly done and that means I’m another year older! Thought you’d like to see what I’ve been up to. 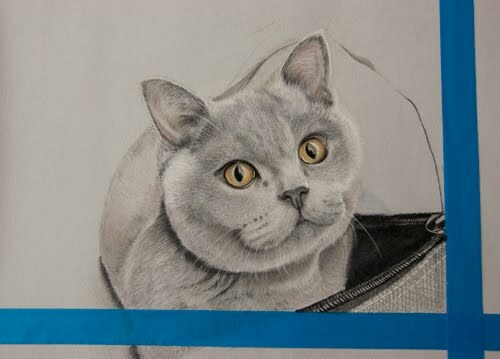 You might recall that I am working towards a Pet Portraiture Diploma with the London Art College…well this is the last piece that makes up my penultimate set of work. the brief was to create an artwork with an animal in surroundings that portrays it’s personality. Now I didn’t think I was into animals in clothes, but I have to say I loved doing this piece. It all started when I went to the supermarket to do the shopping. I was in the drinks isle and I saw a wierd looking bottle. Anyone who knows me would tell you that I’m a marketing mans dream. If it’s in a lovely box or an interesting shaped bottle then it’s in my basket! Simple as. So take a look at what that little bottle sparked off.. I had a great time at the Cambridge Cat show and met some lovely people. 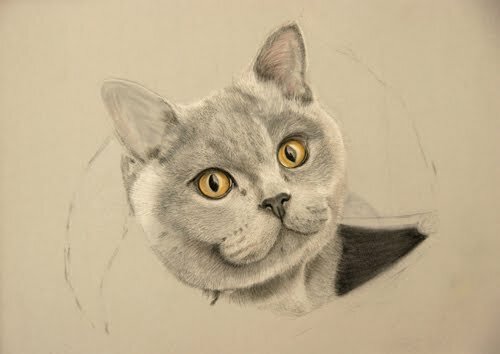 I picked up a few commissions so watch out for updates about their progress in the blog. Next week I’ll be in Brigg – South Humberside for the One for all cat show which is over 2 days, so I’m very much looking forward to that. At the last show I was still working on Amber so I thought you’d like to see a step by step and the finished portrait. the original shot came about as my husband John was setting up in his studio for a shoot. Amber decided that she would help him and was rummaging around in an Octa reflector bag to see what she could find! the result was a shot with a great expression – so alert – I couldn’t resist capturing it as a portrait. 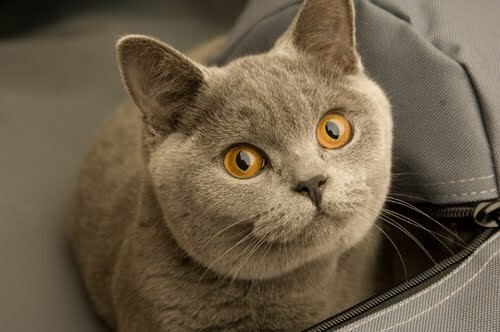 Amber is a British Blue shorthair and typical of her breed she has amazing orange eyes. For my lastest set of college assignments I needed to create a portrait with a contemporary look. 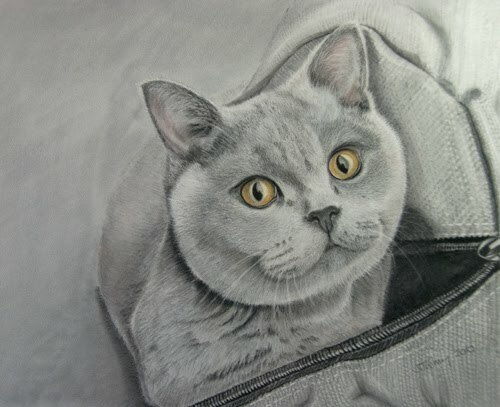 I decided that this would be a fairly monochromatic study to make the most of Amber’s eyes. I’m sure that everyone has seen the type of thing in wedding photography where you have a black and white image with spot colour to highlight a particular feature. That was the feel that I wanted to create, so I chose a background colour that matched Amber’s fur. This first image looks quite scary I think, it shows the outline and Amber’s piercing eyes. If you’ve read my blog before, you’ll know that I like to work on Hahnemuhle velour with pastel and this was no exception. 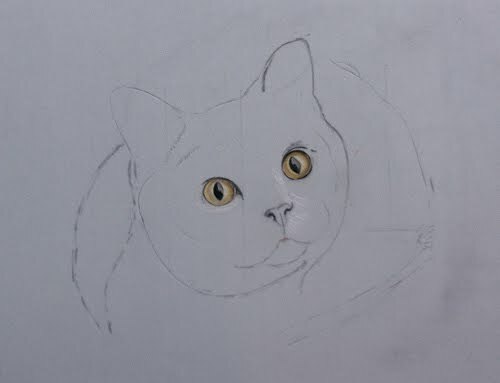 Next I started to block in some of the shadow area around the eyes. 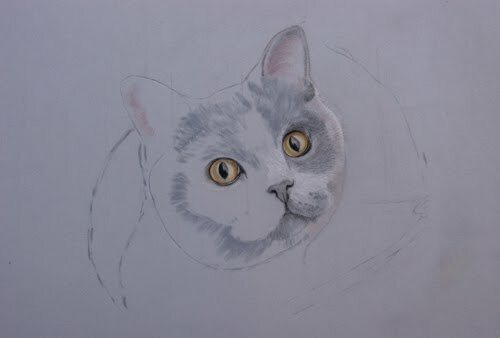 At this stage I was using Daler Rowney soft pastel sticks – they have a really good range of cool and warm greys. You can really see the difference in lighting here. The first two shots were at the Addlestone show and the next shots were at the Stevenage show and in my studio. This shot shows detail being added to the face and shadow to some of the surrounding area. I wasn’t really sure on the crop that I wanted until quite late into the portrait, so I used ultra-low tack masking tape to try and find what I was after. Eventually I decided that this crop was too tight and ended up showing more detail of the ba, as I felt that it told a better story. 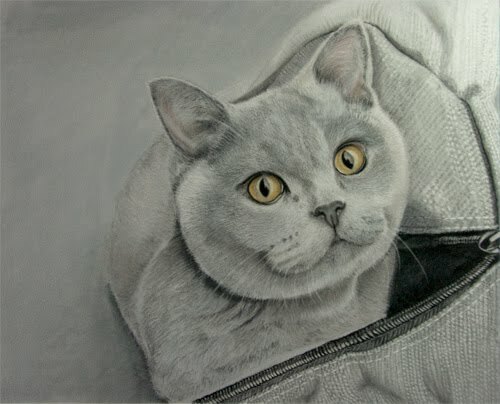 A few more darks added to the fur and the shadows strengthened, then it’s finished.